I know there have been questions like What is your favorite editor/IDE?, but none of them have answered this question: Why spend the money on IntelliJ when Eclipse is free? Many coworkers in the past have told me that they believe Eclipse to be "pretty much the same" as IntelliJ, but, to counter that point, I've occasionally sat behind a developer using Eclipse who's seemed comparably inefficient (to accomplish roughly the same task), and I haven't experienced this with IntelliJ. They may be on par feature-by-feature but features can be ruined by a poor user experience, and I wonder if it's possible that IntelliJ is easier to pick up and discover time-saving features. For users who are already familiar with Eclipse, on top of the real cost of IntelliJ, there is also the cost of time spent learning the new app. Eclipse gets a lot of users who simply don't want to spend $250 on an IDE. If IntelliJ really could help my team be more productive, how could I sell it to them? For those users who've tried both, I'd be very interested in specific pros or cons either way. I work with Intellij (9.0.4 Ultimate) and Eclipse (Helios) every day and Intellij beats Eclipse every time. Code completion and renaming suggestions are so clever that it's only when you go back to Eclipse that you realise how much it was doing for you. For example, consider reading a resource from the classpath by typing getResourceAsStream("/ at this point Intellij will be showing you a list of possible files that are currently available on the classpath and you can quickly drill down to the one you want. Eclipse - nope. The (out of the box) Spring plugin for Intellij is vastly superior to SpringIDE mainly due to their code inspections. If I've missed out classes or spelled something wrong then I'm getting a red block in the corner and red ink just where the problem lies. Eclipse - a bit, sort of. Don't get me wrong, I love Eclipse to bits. For the price, there is no substitute and I recommend it to my clients in the absence of Intellij. But once I'd trialled Intellij, it paid for itself within a week so I bought it, and each of the major upgrades since. I've never looked back. I hear the difference with IntelliJ is that they are much more likely to fix and close bugs that you submit. That could make a big difference if there is some Eclipse bug that is blocking you. On the other hand, you cannot look at IDEs in isolation; you need to look at the ecosystem. Here, I think Eclipse has an advantage (similar to Firefox's advantage over Chrome*): There are many more plug-ins available, and developers are much more likely to write an Eclipse plug-in than otherwise. This is limited to Android development only (In Java obviously). I am coming to this with some limited knowledge of Eclipse and IntelliJ both; however, I have recently had to decide on a development environment for Android. It would seem that the first clear choice would be to use Eclipse since Google supports it with their ADT plugin. Unfortunately, I found it terribly clunky to get around since I am used to Visual Studio (2010, more recently 2012). I have always used ReSharper with Visual Studio so I decided to give IntelliJ a try. After about 10 minutes I realized that I had made the right decision. IntelliJ, as some have stated, indexes everything. The intellisense was a joy to work with and the intelligence surrounding suggestions was excellent. The debugging experience I found to be a pleasure and quite honestly, I really couldn't live without the code analysis. I know a lot of purists would have a problem with that kind of thing but I don't care. I have to push out projects very quickly for lots of people so sometimes it's just nice to run the code anaylsis and see what the IDE suggests. Whether or not you take those suggestions is another story but I didn't find anything like this in Eclipse. Some also say that there is no Android designer in the current version of IntelliJ. This is certainly the case but I wouldn't ever use it anyway. I am debugging on a device most of the time so it doesn't matter. I get to see the interface and play with it everytime I run the program. Anyway, from a traditionally "non-Java" guy I have to say that Java is particularly nice as compared to Eclipse. You need to demonstrate vividly and without doubt that for the tasks you need to do on a daily basis, IntelliJ allows for a substantially amount of time and effort saved as opposed to Eclipse (and NetBeans). This will require you to do some research to find out what that might be, and then construct a demonstration showing this to the people who can decide how to work. My suspicion is that you will find this a rather hard task to do, as Eclipse these days can do quite a bit, reasonably well. If you find killer points, please share - I'm sure plenty want to know. autocomplete for method names - it offers what I want to call them usign convention. jquery autocomplete very easy to set up (never got it workign with eclipse). code inspections, like checkstyle and findbugs, built in and easy to use. jslint and jshint built in and easy to use. maven integration works out of the box straight away. All the settings are where you expect them to be. It does not detect errors incorrectly, I used to get highlighted errors in eclisp ewhere there were none and had to restart. hibernate mappings have autocomplete enabled (a pojos' fields are supplied as autocomplete option in the mapped pojo - gr8). a built in rest client with no extra config required. built in chat client that allows code pointers - actually very useful. persistence view, easy access to your all your jpa/hibernate entities and settings. bug fixing, actual accountable bug fixing I have submitted a number of bugs and they have been fixed promptly. inspection and autocomplete in your xml documents, very very useful with spring (I know this is a repeat but it is great, revealed a myriad of errors). I have been using it abotu 3 weeks now so hopefully find some more soon; its well worth the money. Oh one more thing it actually opens ... I had a bug in my eclipse that meant it would refuse to open. Just "google eclipse wont open" there are loads of links. I feel stupid for taking this long to change. 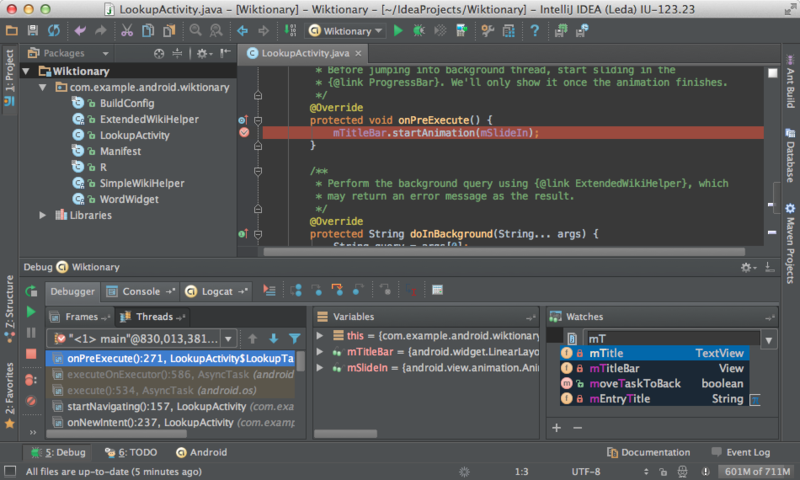 Google just recently announced that it is moving Android development to IntelliJ. There is a reason for this. I have been using Eclipse as an environment to teach courses for the past few years in both C++ and Android/JAVA. I have watched the quality of Eclipse deteriorate to something approaching unusable. In Fall, 2012, I adopted Eclipse Juno for my course and it was an unmitigated disaster. Not only was the program incredibly sluggish and loaded with bugs, it had several user interface changes that were beyond stupid. I now use it as a case study in bad user interface design. I cannot recommend Eclipse to anyone at this point in time. The bug database has gotten so large that there is no chance they will ever address even a small fraction of them. I don't know of solid feature-by-feature blows, but one thing that I've discovered with in-and-out use of the IntelliJ environment for about a decade is that the design teams at JetBrains have done a great job of both having the IDE "index the world" as well as keep the indexing and autocomplete functions both responsive as well as consistent - I don't typically think about it, but with the responsiveness plus the number of keyboard shortcuts (and the ability to map more), IntelliJ makes it very easy to build "muscle memory" when using the editor. It's not a small thing when you can write code, autocomplete, compile and test without your fingers leaving the keyboard, and in a way that doesn't feel like a stereotypical sluggish Java app. Not the answer you're looking for? Browse other questions tagged java ide eclipse intellij or ask your own question. Java IDE written in pure Java? What parts of my computer should I upgrade first to speed up development? What features in Eclipse is not available in Visual Studio? Which past version of Netbeans IDE that has lightness almost equal or better than Eclipse Indigo? Can JSP Expression Language provide type safety like scriptlets in Eclipse IDE? Why is Eclipse platform dependent?